First though, a word of caution. The results that I am getting, and the requirement to build this peltier cooler come from the climate that I find myself living in. For those of you lucky enough to live in places that have mild climates with little day-to-night temperature swing then this will be of only mild interest. You probably find your scope cooled and ready to go after only a couple of hours. For people like me who live in climates that have a regular 20C temperature swing from day to night, however, I hope you find this record of my cooling attempts to be a useful insight into the length that some people will go to get the most out of their scope, and maybe it will give you some insights into the importance of temperature control. I have done a fair amount of imaging this year, starting in early January (mid summer for Canberra). In the previous 10 years or so that I've been living here I hardly bothered at all to try and image in summer cause the thermal gremlins would always kill me. The thermal profile is something like this: sunset temp = 28C, drops 2C per hour until overnight minimum of around 12C at about 3am. As I have said before, passive cooling just does not overcome this temperature range with my 10" 35mm thick mirror. However, this year was the first summer that I was equipped with my peltier cooler so I was keen to give it a try. I still was only able to image from around 3am onwards when the air temperature had stabilised, but at least my aggressive cooling from sunset through until 3am meant that the mirror was already at ambient temp and ready to go. Here's a short detour: I've put up a collection of images on my Image Gallery that show the sort of results I could get by imaging in early morning with a scope that's in equilibrium. 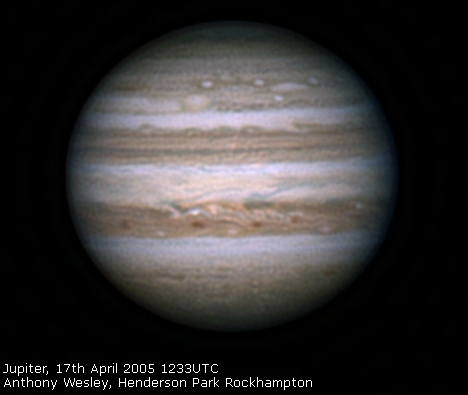 Compare that to the Jupiter image from Part 3 of this story, and you'll appreciate how much improvement is possible. Most of the images in the gallery were taken using the peltier cooler as shown in Parts 1-3 of this story, but I have recently built a revised version that eliminates some of the usability problems with the original. The new version works just as well as the original but is much more convenient to transport, and solves the "heat leaking into the tube" problem of the earlier model. This is functionally almost identical to the old model, but there are a few important differences so I'll descibe the whole thing.. This unit is designed to fit over the mirror end of my tube. The three evenly spaced large holes in the cooler are for my collimation adjusting bolts on the mirror cell. They have to pass through the cooler so I can make collimation adjustments with the unit attached. The circulation fans visible on the first image are small computer cpu fans that just happen to be the same size as the hole in the centre of my mirror cell. When the cooler is attached these fans sit inside that hole, pulling air off the cold plate and blowing it onto the back of the mirror. I have since added a black rubber shroud around these fans to make sure that air must be pulled from near the cold plate. The fans are powered in parallel from the 12v power supply that runs to the peltiers. Notice the circular perspex disk (clear plastic). This is 3mm thick and separates the cold side from the hot side. This disk is large enough to close off the mirror end of my tube, and overlaps by about 1cm all the way around. The overlap prevents any hot air coming off those two heatsinks on the outside of the unit from finding its way into the tube. Sharp eyed readers will recognise the aluminium disk used in this cooler as the same disk that was used in the previous model. I didn't see any reason to have a new one made, so I re-used it. Don't be confused by the four holes visible in it's centre - they were used in the old cooler but are not needed in this version. The aluminium disk is firmly attached to the larger perspex disk using silicone sealant, the same variety normally used to seal bathrooms or gutters. I found it was important to seal around the edge of the aluminium disk to stop water condensing between it and the perspex when the plate gets very cold. 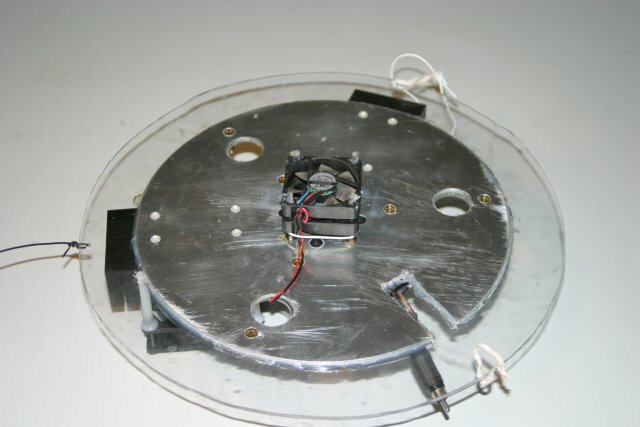 The perspex disk has two rectangular pieces removed for the peltier units to sit in. 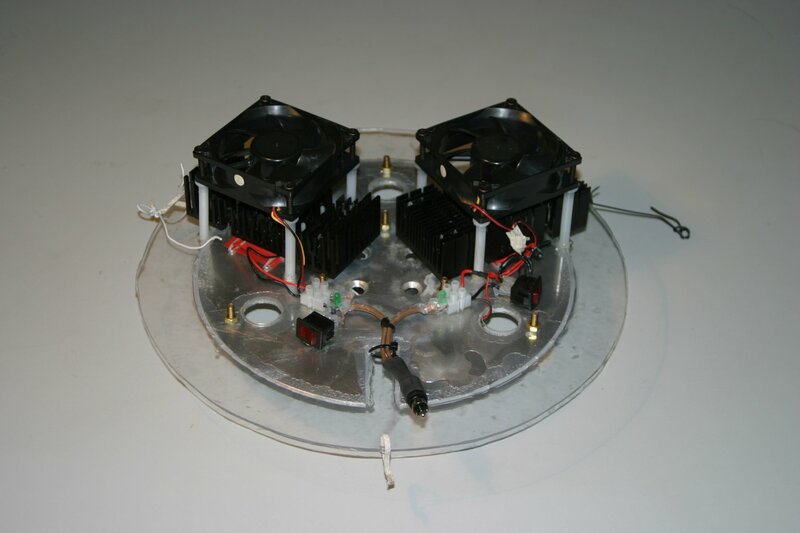 The peltiers make contact with the aluminium plate on their cold side, and the large heatsinks on their hot side. I used nylon bolts to anchor the heatsinks in place so that the bolts would not act as conduits for heat from one side to the other. You can see the heads of these bolts (four on each peltier) in the first image above. I re-used the peltier units and heatsinks from the earlier cooler, but added two switches that can be seen in the second image. These switches let me turn the power on or off to each peltier unit. This gives me more versatility, since I can now operate in three modes - no peltiers, 1 peltier or 2 peltiers. The circulation fans are always running so the "no peltiers" mode is useful when I just want to circulate the air around the mirror without extra cooling. 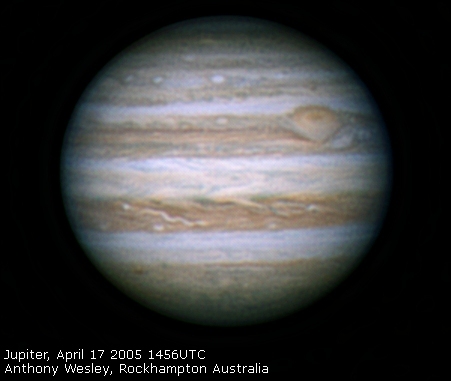 An image of Jupiter taken at 4:02am on this night.. NOTE Due to the 1 hour difference introduced by daylight savings in summer, this graph is 1 hour out. 4:02am actually shows up on this graph as 3:02am. 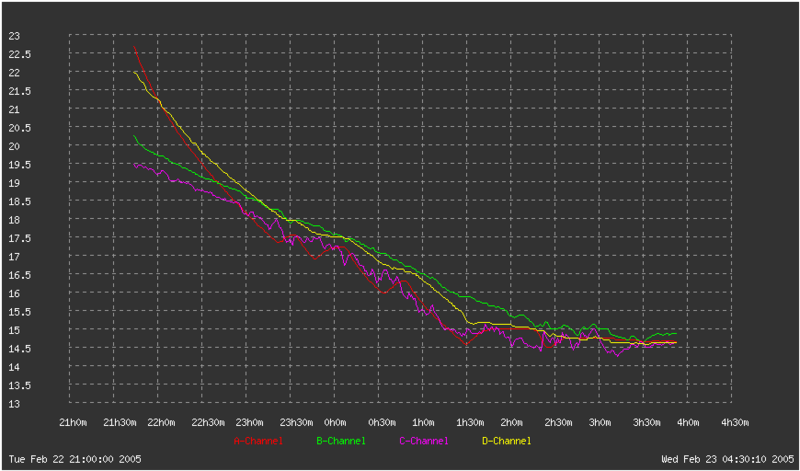 The scope was setup pretty much on sunset (8:30pm, shows up on the graph as 21:30, again out by an hour due to daylight savings) and the cooling turned on. You can see that the mirror (back sensor and side sensor) starts out at about 22C and cools quickly when the peltiers are running. 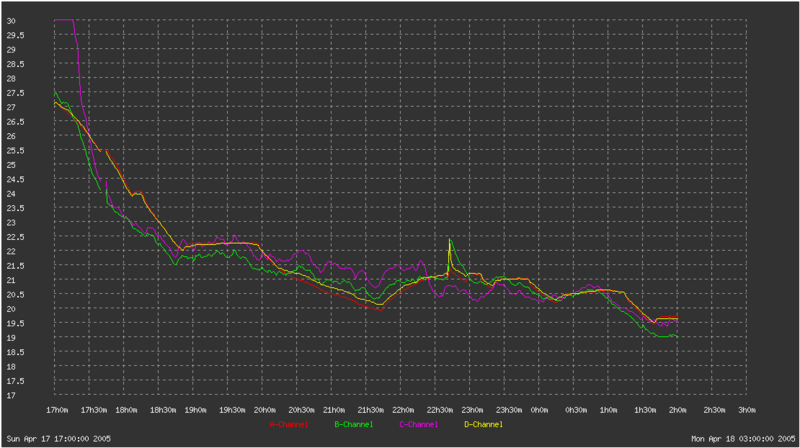 The air sensor and tube sensor show how the ambient temperature changes during the evening as everything cools down. Notice also that the mirror temp starts to oscillate once the mirror reaches the same temp as ambient. I have a small laptop that is watching these temperature readings, and it turns power off to the peltier automatically when the mirror reaches the target temperature. If, as we see here, the air temp keeps dropping, then it will turn the power back on again a short time later. It averages together the readings from the two mirror sensors (side and back) so that I have some idea of how the mirror is reacting as a whole. The (back mirror sensor shows a temperature rise of around 0.5C when the cooling is turned off, I am guessing that this is due to the thermal gradient inside the glass mirror slowly evening out. The inside of the mirror will be a bit warmer than the edge at first, but over th space of about 30 mins this gradient disappears and the mirror as a whole reaches equilirum. On the graph we can see that the cooling was turned off at about 3:30am (marked as 2:30am on the graph), so by 4am the mirror was dead on ambient temp, and some very nice images were grabbed. The very high ambient reading at the start of the graph was because that sensor was in direct sunlight for a while, before sunset. Again, notice that the cooling is able to very rapidly bring the mirror temp under control, and by about 7pm (19:00 on the graph) the system is in housekeeping mode, just kicking in every now and then to make a small adjustment. The temperature spike at about 22:40 was caused by operator error, I accidentally unplugged the sensors while reorienting the scope to point at Jupiter. I am now very happy with my cooling system and the results it produces. I can highly reccommend something like this for people who live in regions with large day-to-night temperature swings if you want to get the most out of your scopes. Update! A New Version of my cooler is under construction, promises to be the best one yet!.